- Acrylic paint (or nail polish) in white, lavender and purple. Alternatively you can use just white and purple and mix the two colors to get an intermediate. - Accent color (acrylic paint or nail polish) - I used Sinful Colors Flower Girl which is a nail art polish. - Fill in the area with white paint or polish. NOTE: I prefer acrylic paint for this step because it dries quickly. 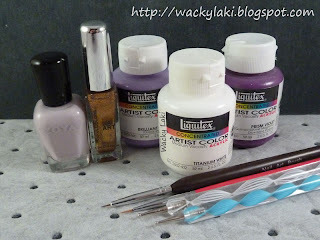 - Using a medium size dotting tool and the darker color (purple) make 5 dots in a flower shape. - Add a dot in the middle of the flower to fill in the shape. - Using different size dotting tools add desired number of flowers. - With a slightly smaller dotting tool, place a lavender or white dot on top of each existing purple dot in the flowers. - There should be some purple showing along the edge of the new dot. 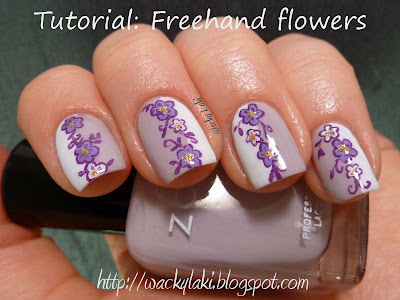 - Fill in the center of the flower using the lavender or white color. - Repeat this for all the flowers. - Add a top coat to seal everything in and you are done! I hope you enjoyed this tutorial and I would love to know what you think of it! Love this, the tutorial is so easy(well you make it look easy). Can't wait to try it. I am wearing similar shades at the moment, so will try a different combination. Thanks. My gosh, Anutka! You're SO good in freehand nailart!! W♥W!! Wow, this is amazing. Thanks for the tutorial. Hii LOVE your amazing blog so I followed you. I made an attempt for this creation.. even though it didn't turn out as neat as yours ^_^ ! Just tried this today! Quite time consuming, but that's mostly because I used all polish and my base coat took forever to dry. Here's a link to my pics!